This is old version Shazam 6.7.1-160719 apk for Android, you can install it if you want to downgrade or install old app. It is top Music & Audio apps from Shazam Entertainment Limited. Once it is done, you will receive complete list about artist, album, title, etc. Another feature is integrated with online music store, so user can buy directly to that song. This application is very useful for music addict who want to listen anything new but has no idea about the song title. Developer say this app uses acoustic fingerprint to help searching through billions songs. By using internal microphone on smartphone, this app will identify precise sampling of audio. Acoustic fingerprint is new technology to identify audio through bit rate, frequency, and melody. User can share their tagging via social media to spread more possibility to find songs. Shazam has been downloaded millions times and become top ten application on popular store. Free service will get limited access, but you can expand with paid version. 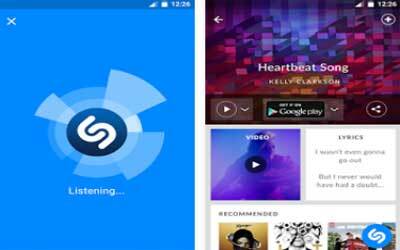 Therefore, Shazam for Android is the best application to find your favorite song immediately. This update includes our new Shazam result page, making it easier to discover more! After you Shazam a song, scroll down to see videos, lyrics, related tracks and your favorite streaming services – all with a new, cleaner design.